Cool some water below 32° F and it freezes into solid ice; heat it above 212° F and it boils, becoming gaseous steam. 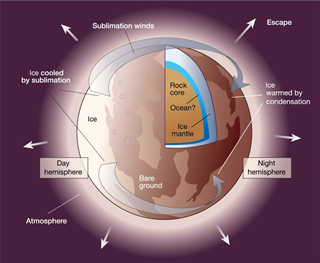 Pluto's ices sublimate directly to gas in the same way. Sunshine is weak on Pluto, about a factor of a thousand weaker than on Earth, but it still provides enough heat to cause a little bit of Pluto's surface ices to sublimate into the atmosphere when the Sun shines. Nitrogen is the most volatile of the three known Plutonian ices, followed by carbon monoxide, and then methane. When a mixture of the three ices sublimates, the nitrogen is most readily lost, while the methane tends to linger behind. The surface composition gradually changes as a result of solar-powered sublimation. Another, more exotic kind of phase change affects Pluto's surface ices. When nitrogen ice is cooled below -396° F, its molecules move around and reorganize themselves from a hexagonal crystal structure into a cubic crystal structure. On warming back up, they revert back to the hexagonal arrangement. Although they are unfamiliar in room temperature materials, this type of phase change between two different solid phases is common among volatile ices. Methane ice has such a transition at -423° F, and carbon monoxide has one at -350° F. Ethane ice, also present on Pluto’s surface, has two phase transitions, one at -298.0° F and one at -298.2° F.
These exotic volatile ices may be the construction materials for what are expected to be correspondingly exotic landforms on Pluto. These will be imaged in exquisite detail by the New Horizons LORRI and MVIC cameras, and our LEISA instrument will reveal what ices make up these landforms. Will Grundy, a New Horizons co-investigator from Lowell Observatory in Flagstaff, Ariz., leads the mission team’s surface composition theme group. His wide-ranging expertise includes icy outer solar system surfaces; telescopic observations of infrared and visible wavelength reflectance; spectroscopy; lab studies of cryogenic ices; phase behavior of ice mixtures; radiative transfer; Kuiper Belt objects; binary and multi-body system orbits; and thermal infrared observations.